Let’s be honest: we all want to look dapper in our clobber – whether down on the sand or in the bar quaffing a cold one after our latest sesh. If you can stand out by draping unique threads across your chest then all the better in our book. Enter stage left Procella Clothing – born from individuality and wanting a garment more representative of the saltwater lifestyle we lead. The brand is manufactured from quality, eco-friendly, organic materials and promotes a less mainstream, slightly retro and more unique attitude. The company name comes from founder Jason’s nerdy interest (his description not ours! – Ed) in ancient Greek and Roman history. Procella is Latin for wave, hurricane and tempest – the very things we as saltwater babies love, want and need. We were sent a T with one of the brand’s multi activity straddling designs – it’d be perfect for those into a various H20 disciplines as well as SUP. It fits comfortably, feeling soft against bare flesh and has a flattering cut – not too baggy or skinny. Rocking the Procella T at the beach garners a certain level of interest from quirky logo spotters. With many tired of the usual big industry ‘sameyness’ you find in high street stores, something fresh will always be a head turner. Having a name and image representative of the sport(s) we do gives a more personalised feel to your wardrobe. 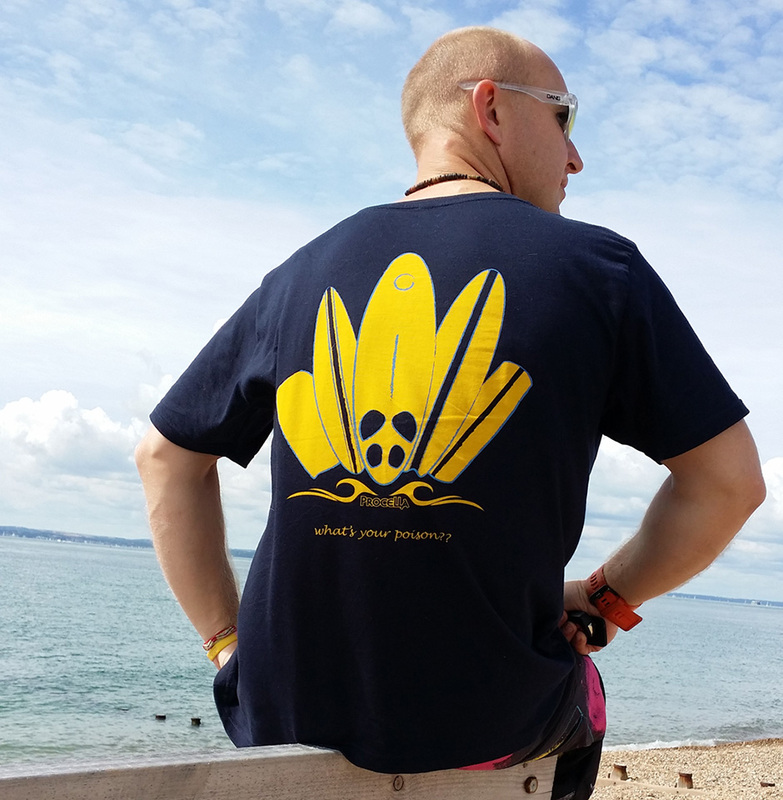 Procella threads positively scream: ‘I actually SUP otherwise I wouldn’t be wearing this!’ And if you want even more authenticity, the crew behind the name are all involved, to varying levels, in ocean sports. Procella Clothing is a unique and individualistic ocean sport brand whose iconic designs embody the attitude and stoke of what stand up paddlers subscribe to. Stylish, eco-friendly credentials and super comfy to wear garments; Procella surely fits the bill for your next apparel purchase.